Offering a superb range of made to measure diy composite doors including front doors, back doors, cottage style doors, modern and contemporary doors, fd30 composite fire doors, timber composite doors and upvc doors manufactured to a high standard of quality and bespoke specification. We supply an extensive choice online in a beautiful array of door and frame colours along with a great selection of quality suited furniture and optional contemporary hardware and handles plus high security Yale and Ultion kitemarked cylinders with PAS24 certified locks, this helps achieve one of the most secure and best composite doors available in the UK today. Prices start from only £459 inc VAT with free delivery and backed with a 10 year parts guarantee for complete peace of mind. We won't be beat on price, quality and service - we guarantee you will not find cheaper and better value composite doors anywhere else! The vast online range of diy composite doors, glass designs and colours available offer an individual statement that will immediately improve the visual appearance of your property with the added bonus of maintenance free. Cut out pushy salesmen, their commissions, needless marketing budgets and overheads - buy composite doors supply only and direct from the leading door manufacturer to enhance your home's safety, security, thermal efficiency and property value, saving £100's when compared to other competitor composite door prices. Manufactured in the East Midlands, our custom made to measure secure composite doors are supplied pre hung in a upvc thermal efficient outerframe. We guarantee you great value composite doors without compromising quality and with a service second to none (don't take our word for it, please visit our customer reviews) - we want you to make the right choice when replacing your old door and consider a new composite door online from the countries leading door supplier to the Trade & DIY. Decorative crystal bevels, triple glazing, beautiful climbing roses or the more traditional glazed and leaded glass designs are available along with glazed or matching composite side panels and glazed top lights in our extensive colour range inc. grey, black and white. Give your home the look and style it deserves and replace your old door today with a new super strong, energy efficient and secure composite door. 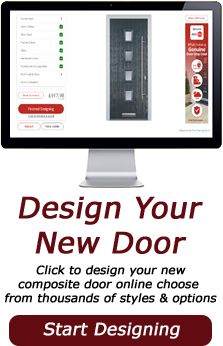 So why wait, order your new external door online or call us on 01530 515160 or 0844 846 8877.